Ray’s work has recently been shown on The Guardian website – you can read the article below, or view it on The Guardian here. 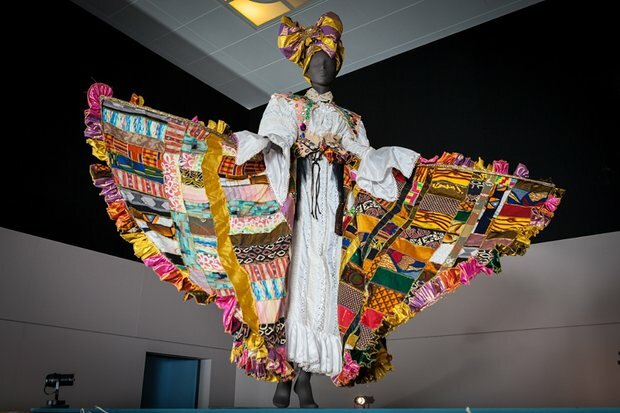 A giant carnival queen looms over the British Library’s new show West Africa: Word, Symbol, Song. Below her, David Rudder’s Notting Hill carnival classic Calypso Music pumps out of speakers, and footage from carnivals past can transport you back to Portobello Road in 1993. The exhibition celebrates the complexity and diversity of west Africa’s heritage, while never sidestepping the more thorny issues of rebellion, protest and the transatlantic slave trade. The decision to limit the scope to west Africa was taken after many months, when it was acknowledged that there was too much material to explore the whole continent. Central, east and sub-Saharan Africa shows will follow. Divided into five sections, the exhibition is unflinching, funny and a labour of impressive research. It involves collaborations with south London drumming groups, New York academics, west African lorry drivers, Nigerian scholars and community organisations. It gives a way to thread people, ideas and objects together – and explores African history from a non-institutional perspective. The earliest item is a European engraving of Benin society from 1628, providing a reference for social structures at the time – a far cry from the stereotypical “barbarous natives” narrative, as well as a late 18th- or early 19th-century “saddlebag Qur’an”, which was designed for reading on the hoof. There is a galling 18th-century diagram that outlines the “best” way to cram slaves into the hold of a ship, meticulously illustrated with men and women lying top to toe. This is accompanied by original material including pamphlets, poetry, letters and classical-music scores by leading African abolitionists such as the poet Phillis Wheatley, composer Ignatius Sancho and philosopher Ottabah Cugaono. There are real surprises: for example, that Tuareg rebels didn’t destroy most of the famous Timbuktu manuscripts, as is often assumed. Local people stashed many of them away or smuggled them out. The manuscripts remain in Mali, as part of the endangered archives project run by the British Library. But there are many similar manuscripts on show, and thousands more besides across the continent. Some of the smallest items are the most powerful. There is an angry letter written in Arabic – “Give me back my book!” – from the 19th century. A poem from the 17th-century Islamic scholar Nana Asma’u, which exemplifies women’s active public role in Islam. In the section of the exhibition called Speaking Out: Dissent and Creativity in the Colonial Era and Beyond, are pamphlets, posters, novels and newspaper cuttings that bring to life the vibrancy and urgency of postcolonial independence struggles. As reading and writing became political tools for popular movements, colourful cloth printed with Senegal’s President Senghor’s face shows how the message went, as it were, viral. Subtle digs at British intellectual snobbery, with Mabel Dove’s parody of George Bernard Shaw’s The Adventures of a Black Girl in Her Search For God, show the colony cleverly answering back. While Shaw happily critiqued the British colonial administration for outdated racism, it was Dove who showed up his portrayal of African women as old-fashioned and ridiculous; her “African woman” is sporting a tennis racket and criticising the church. West Africa: Word, Symbol, Song is at the British Library, London, until 16 February 2016.